HPC promotes self reliance, sustainability, and preparedness skills. 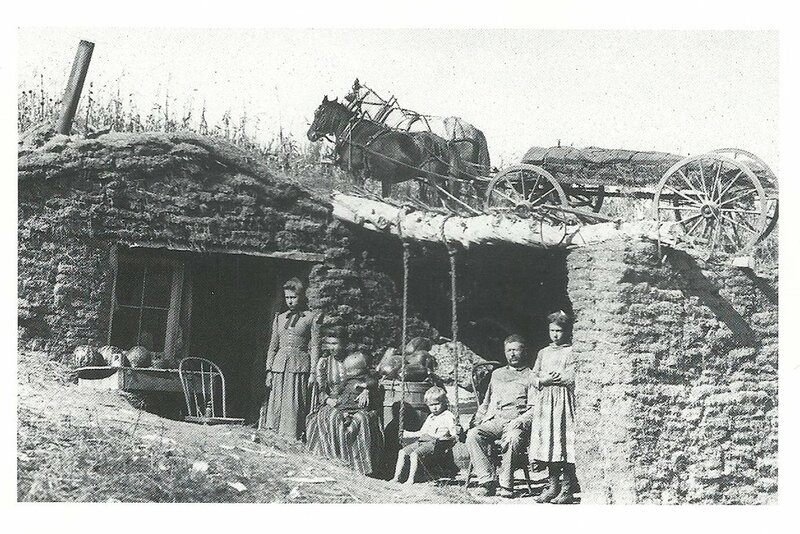 Homesteading is a lifestyle of self-reliance and living a simple, purposeful life. Self-reliant living means learning to grow your own, make your own, sell your own, and bake your own. 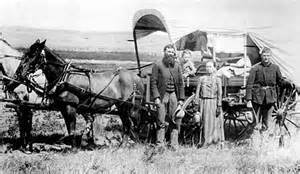 It is about learning basic skills that were common skills your grandparents or great grandparents used everyday. needs, home repair needs, and moving toward a debt free life. "The Back to the Land Movement." It is a economic choice and social choice. job loss, natural disasters, power failures, and illness or INJURY. A few years ago I installed a rain garden with Native plants. 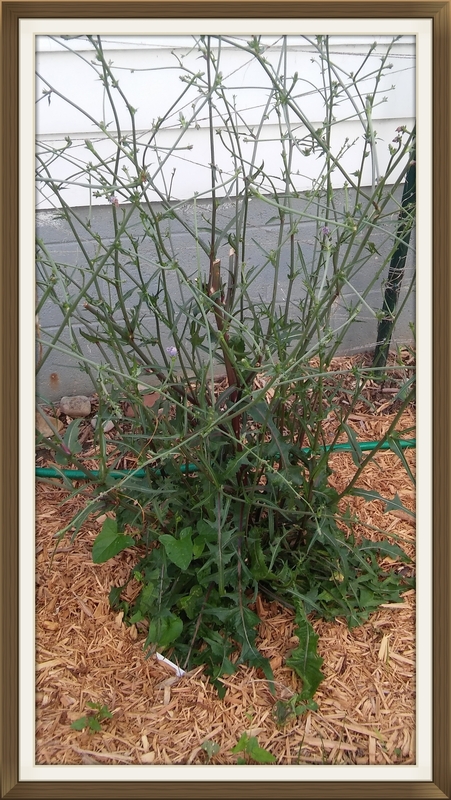 To attract Monarch butterflies I planted Milkweed and Goldenrod. Why did I choose those two plants? Monarchs only lay their eggs on Milkweed. When the larva hatches it will feed on the Milkweed plant. It takes about a month for the Monarch to go through the stages from egg, to larva (caterpillar), to pupa ( chrysalis), to butterfly. 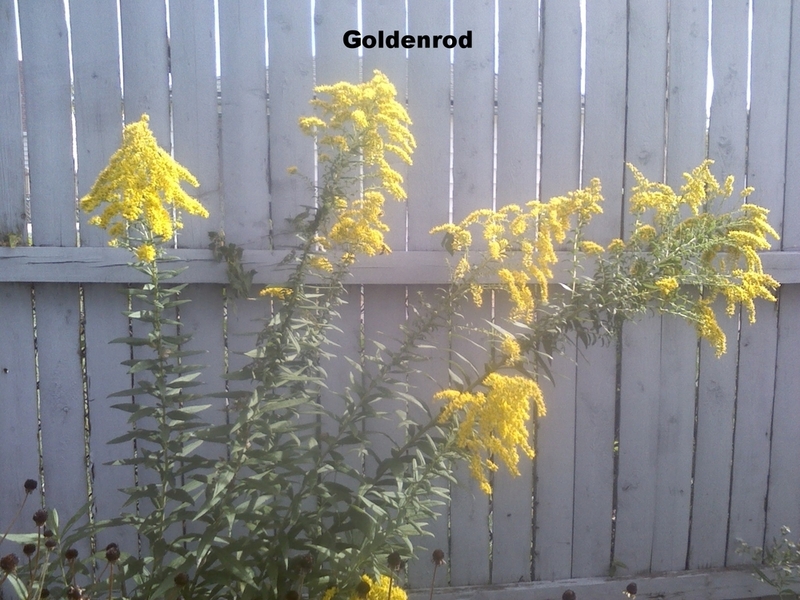 When the Monarch is an adult butterfly it will then feed on the Goldenrod plant. I have patiently been waiting for Monarchs to visit my garden. 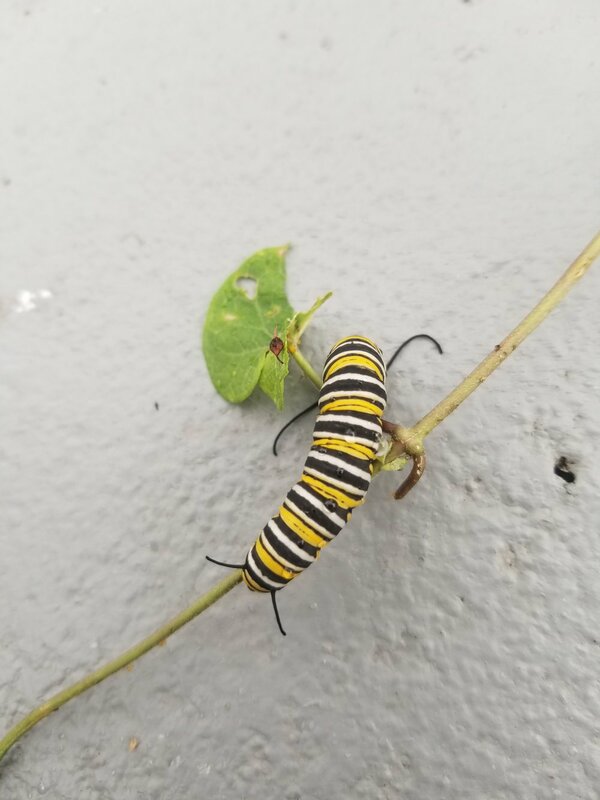 A few weeks ago I was picking tomatoes and I noticed a Monarch caterpillar. And a week later I was washing dishes and I looked out the window to see two Monarch butterflies in my garden. I grabbed my phone and ran outside to get pictures of my visitors. My garden has become a lush habitat attracting praying mantis, grasshoppers, crickets, birds, squirrels, raccoons, and other small wildlife. I am thrilled that my Native Plant Habitat is providing food for the Monarch butterfly and a home to so many creatures. Yes, you can have a garden in a pond. Last year I had Duckweed, Creeping Jenny, Water Lettuce and Cattails in my pond. But, late last year I added fish to my pond and I had to thin out some of the plants. I kept my Water Hibiscus and it bloomed last week. My next pond garden will include more edible pond plants. In conversations about gardening, I have heard people comment that a small garden will not produce enough harvest to can or freeze. They feel it is not worth their time to plant a small garden. This misconception about small gardening keeps people from enjoying fresh food and the ability to preserve food for the winter months. In my small garden I planted tomato, cucumber, pepper, broccoli, and sweet potato plants. I only planted 2 cucumber plants in my small garden and I harvested enough cucumbers to can 80 pints of pickles. 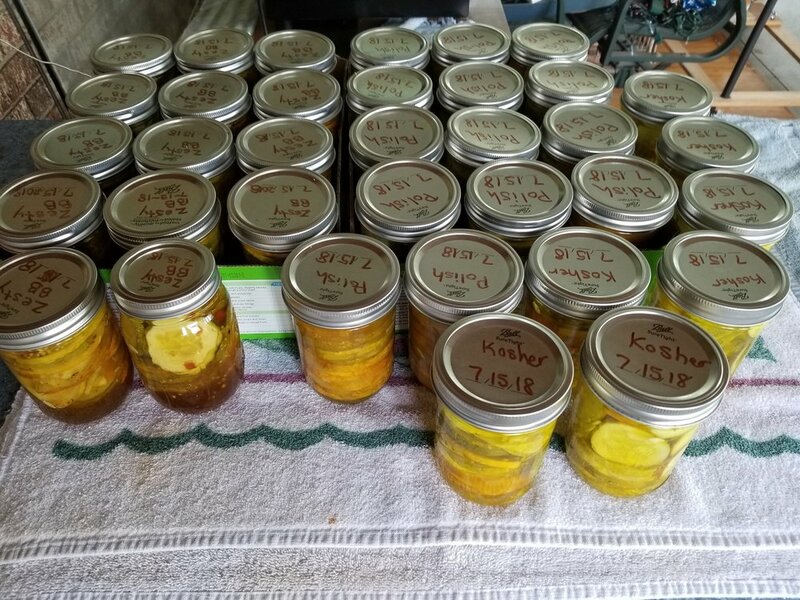 I canned Kosher, Polish, Spicy, Bread and Butter and Zesty Bread and Butter Pickles. I think I am pickled out. The photo below is the first batch of pickles. I harvested the tomatoes and I canned tomato sauce, chili sauce and salsa. I diced peppers and made stuffed peppers to put in the freezer. This was my first attempt at planting sweet potatoes and I had a nice harvest. My small garden is keeps me busy and my freezer and pantry are full, so don’t let the small garden misconception stop you from planting a garden. Each year I like to try something new in my garden. 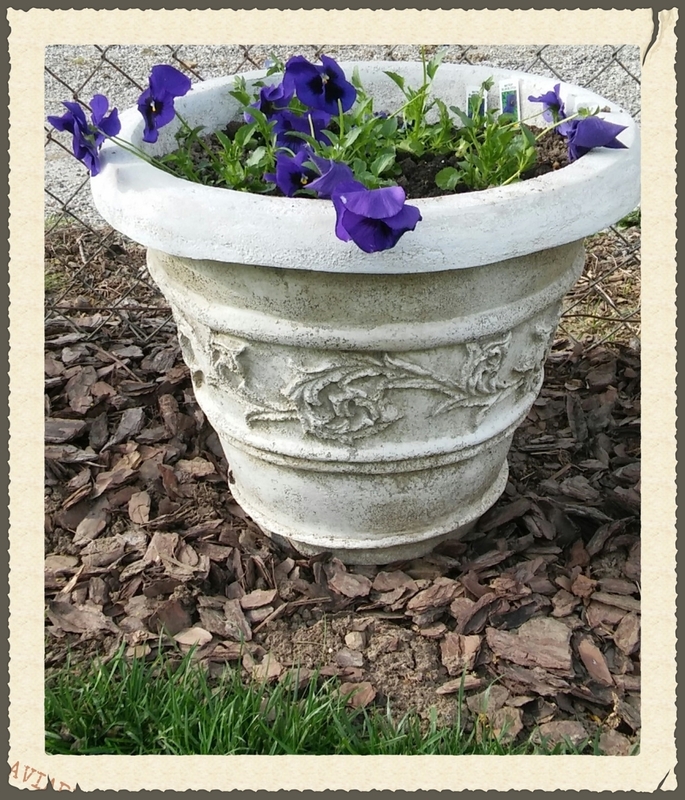 Either I try a new planting method or plant a new flower, vegetable or fruit. 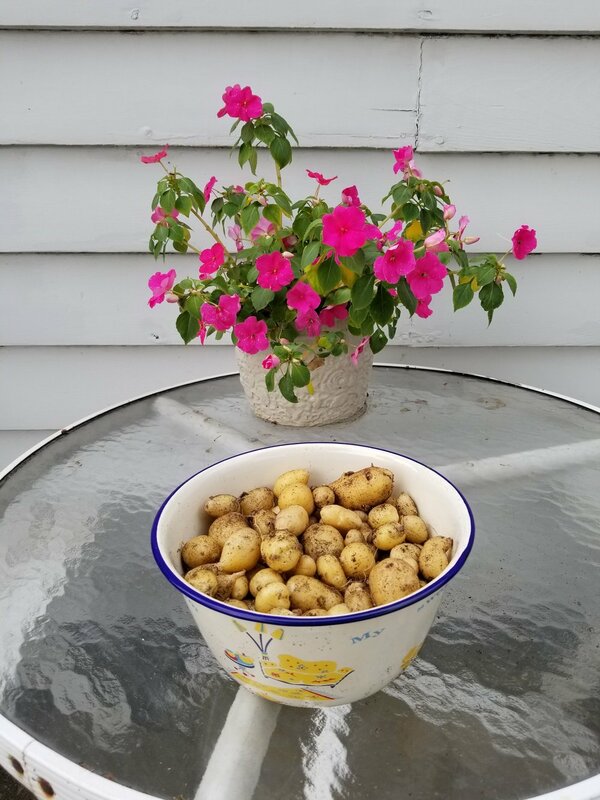 This year I experimented with seed potatoes. 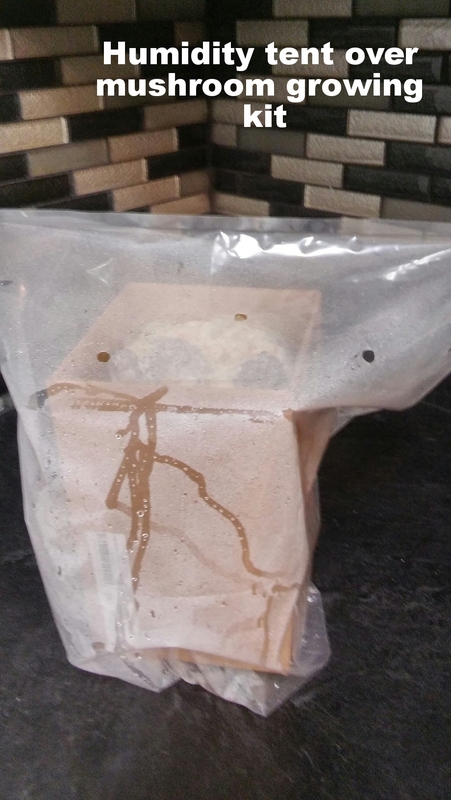 I planted seed potatoes in a trash can and I drilled holes in the bottom of the can for drainage. 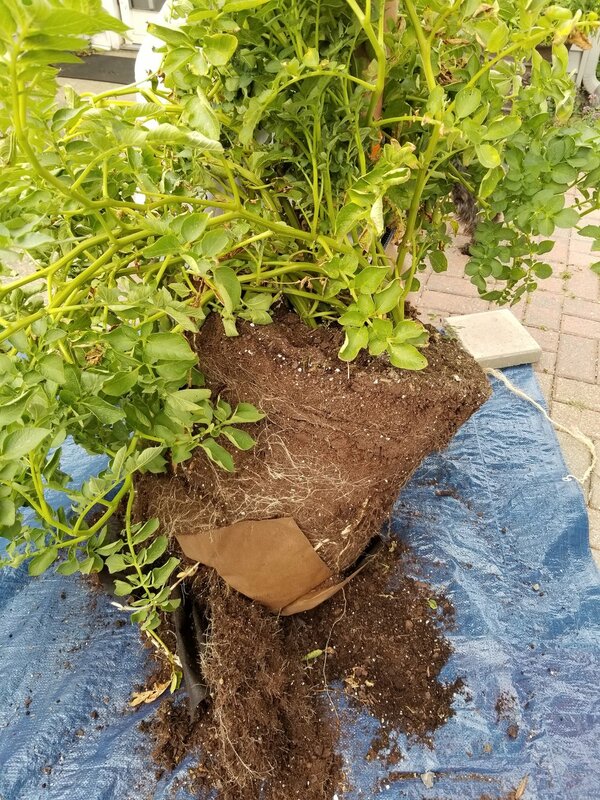 When I was ready to harvest, I put a plastic tarp down to dump the soil and pull out the potatoes. I used the potatoes in a pot roast and it was a tasty meal. 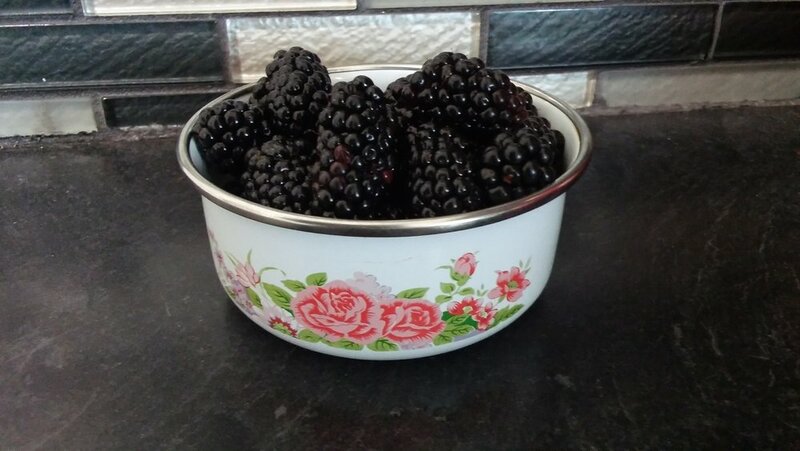 It is a joy to pick fresh berries from my garden. But I do have to get up early to beat the birds to my berries. 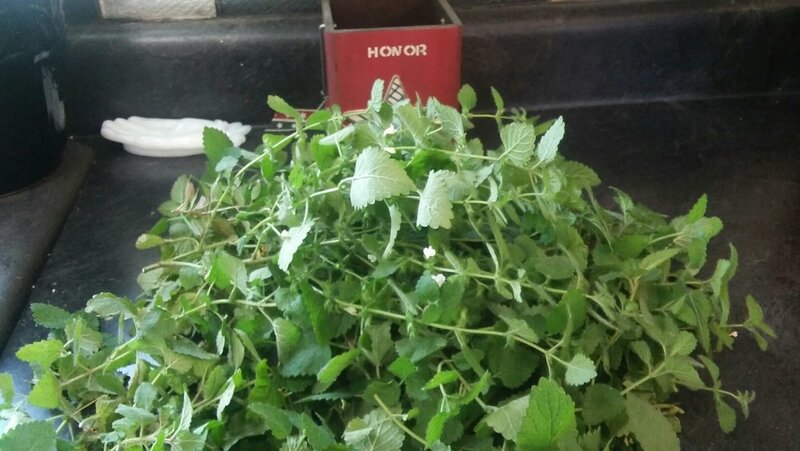 I had an overabundance of peppermint and lemon balm and I am always looking for new ways to use these herbs. I watched the 2018 Homesteading Summit and one of the presenters made herb infused oils. These oils can later be used to make salves. 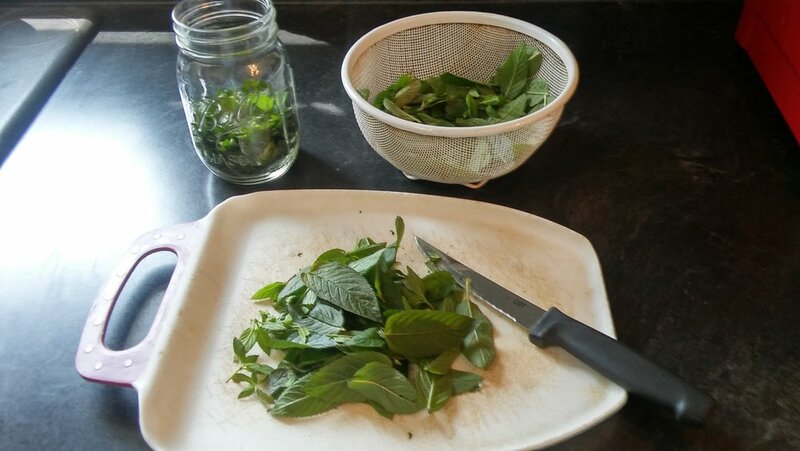 The process is easy and I am all about a fast and easy way to preserve my herbs. First collect fresh herbs, cut, put into a canning jar, cover with olive oil and put a lid on the jar. Place the jar in a pan of water and bring to a slow boil on the stove. Once it begins to boil then turn down the heat and let simmer for 2 hours. Make sure to keep a close watch on the water level as it simmers. Do not allow the water to evaporate away. After 2 hours turn off the heat and allow the jar with the herb oil to cool. Once the herb oil has cooled, strain the herbs from the oil and save your infused oil. This oil can later be made into a salve. This was my first try at making infused peppermint oil. 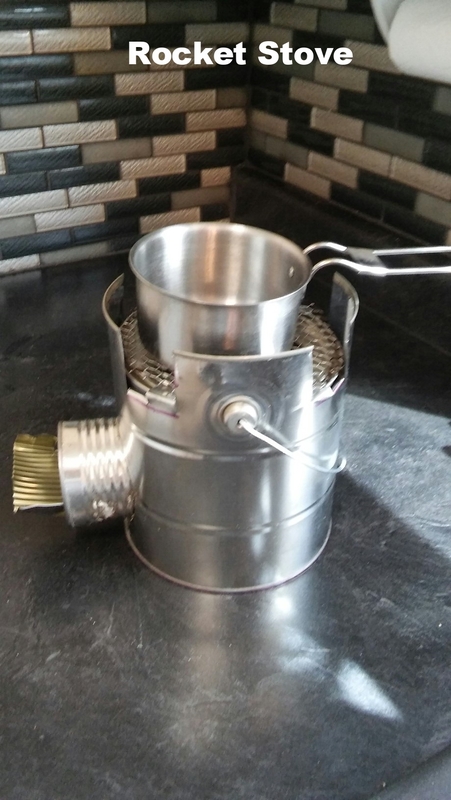 Next time I may experiment and use a crock-pot instead of the stove top method. I will use the peppermint oil to make a pain relief salve for sore muscles and joints. 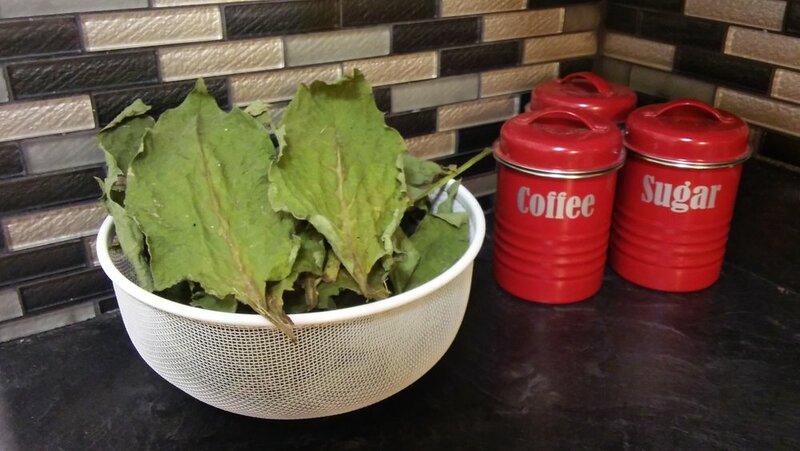 Summer has arrived and it is time to harvest medicinal weeds. Dandelion's seem to be the first weed that is plentiful. I dug up the plants, rinsed with cool water, and separated the roots, leaves and flowers. I dried the roots and leaves for later use. I could have made Dandelion jelly or wine. Maybe next time. One of the medicinal plants in my yard. Winter is a good time of the year to work on projects after the hustle of summer gardening and fall harvesting. My new projects are wine making and natural soda fermentation. I bought wine making equipment over the weekend and I made my first ginger bug and batch of ginger soda. I have a stack of wine making and fermentation books to read in the next few weeks and numerous recipes to sort through. This will keep me busy for awhile. The only downside to wine making is the long wait for the finished product. 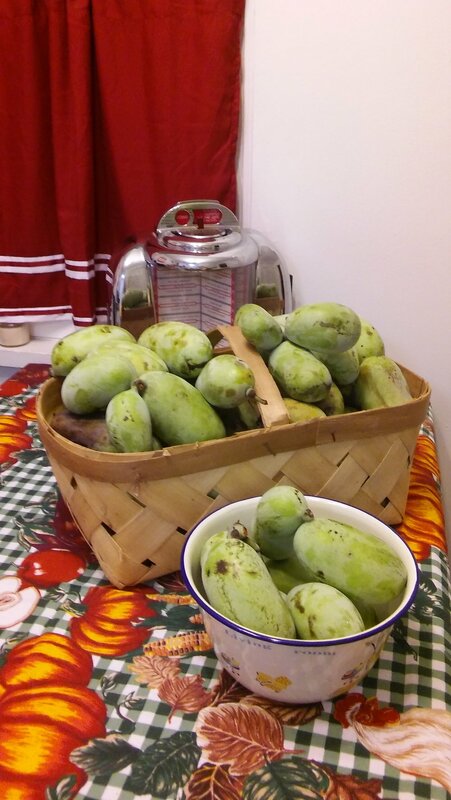 I harvested Paw Paw fruit in the fall and I have the pulp in freezer bags in my freezer. So, I think my first wine will be Paw Paw wine. Sounds good to me. In August a coworker mentioned that he had a Paw Paw tree and the fruit was rotting on the ground. I told him that I had not tasted a Paw Paw fruit and I knew very little about them. The next day he brought in a basket of Paw Paw fruit for me. I discovered Paw Paws go bad very quickly and I decided to process and freeze the pulp for later use. 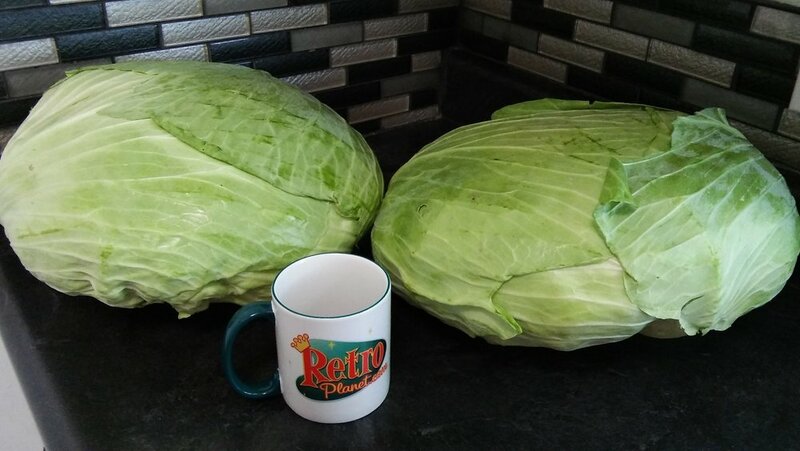 Have you ever seen a cabbage this big? 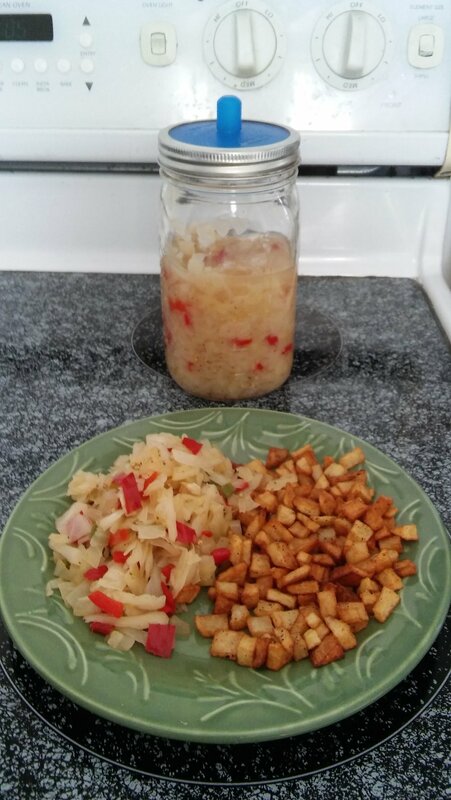 I made Sauerkraut, coleslaw, Krazy Kraut, and potatoes and kraut. How many ways can you make cabbage? Let me count the ways. 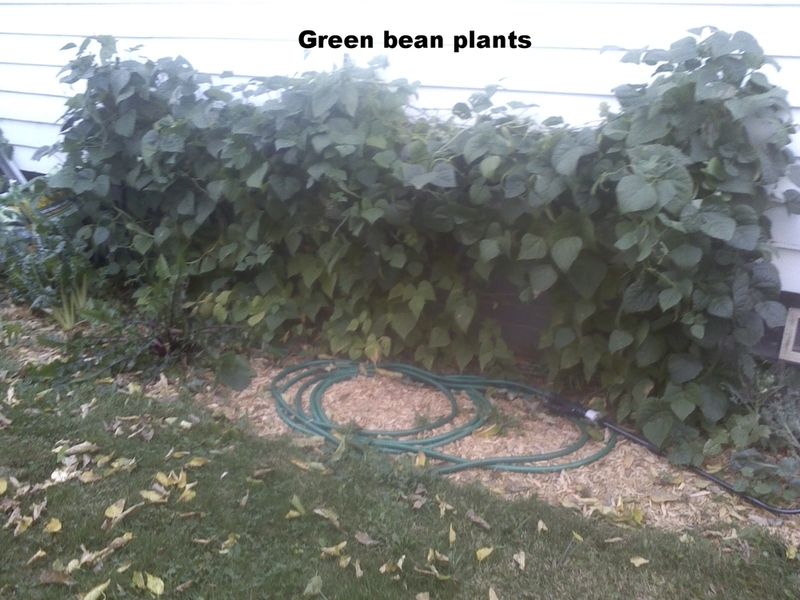 It is such a joy to walk out into my garden and pick fresh green beans, celery, and potatoes. I cleaned the harvest and put the vegetables into a crock pot. I added onions and ham. As it cooked the aroma filled the house and it smelled delicious. In the pictures below I included the celery start and the plant at harvest. Last spring I bought a celery stalk at my local grocery store. 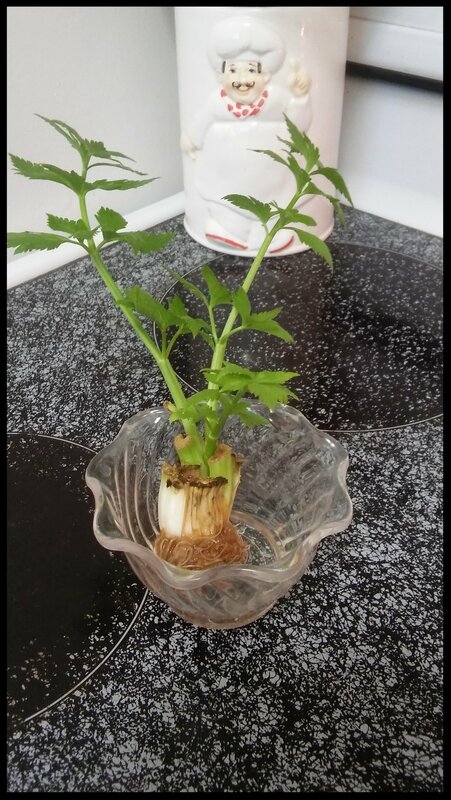 When I prepared a meal using the celery, I cut the bottom off and put it in water to sprout roots. 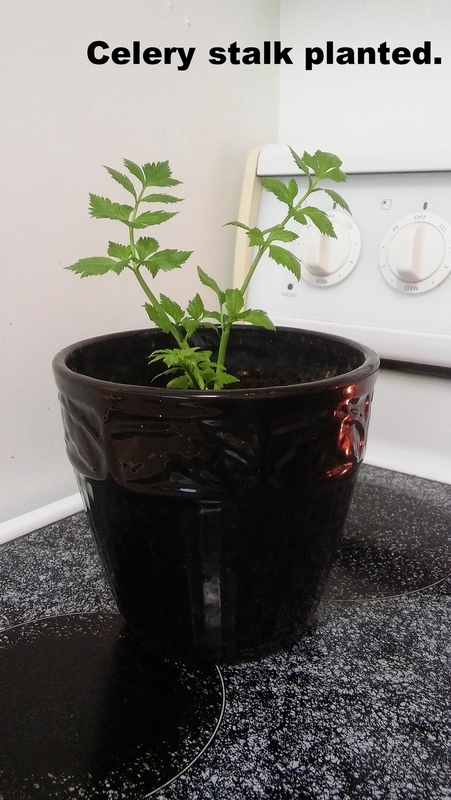 After a month I planted the celery start in a pot and placed it in my kitchen window. A few months ago I transplanted the celery plant and it has doubled in size. I should have transplanted it sooner but other projects kept me busy. 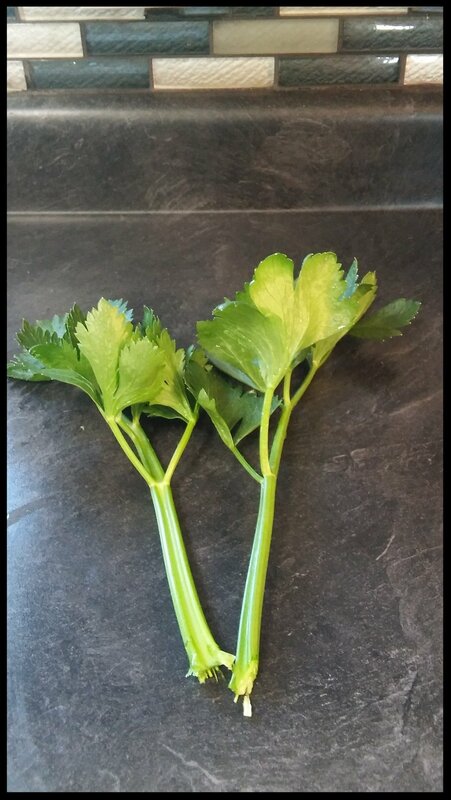 That is how easy it is to grow celery. Fall is my favorite season. The hot muggy days of summer slowly slip away and the cooler crisp days of fall arrive. The greenery of summer fades away and fall brings a burst of colorful foliage. There are so many fall activities to enjoy. Pumpkin picking, fall festivals, hayrides, Halloween, apple picking, corn mazes, bon fires, and hot cider. 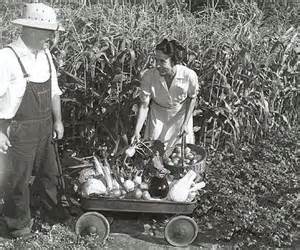 And of course, it is a time to harvest and preserve your garden produce. 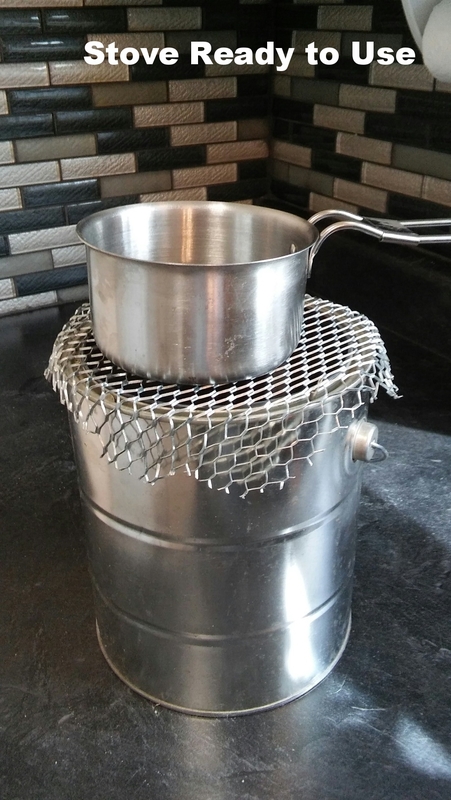 It is a busy time, canning, freezing and dehydrating your produce for the long winter ahead. I have canned 7 quarts and 15 pints of bread and butter pickles and 10 pints of mint jelly. I put a dozen corn on the cob in the freezer and next weekend I will can salsa. I made an inexpensive homemade drying rack out of recycled window screens and I dried mint, basil, and orange peels. 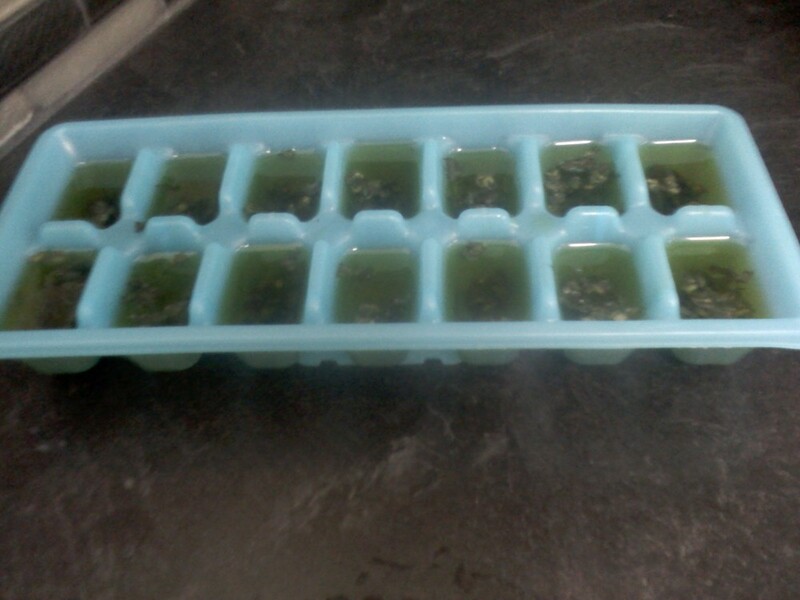 I also, chopped basil and froze it in olive oil cubes. In the next few weeks I will have potatoes, green peppers, tomatoes, hot peppers, onions, chives, and a few green beans to harvest. After the harvest it will be time for me to enjoy the fall fun. Fall - I love it. My garden is producing cucumbers faster than I can find ways to use them. I canned bread and butter pickles last night. By this weekend I need to find another cucumber recipe. What do you do with the veggies from your garden? I didn't plant squash this year but a friend has supplied me with more than I know what to do with. I have to rotate the cooking methods so that we don't get tired of the same recipe. 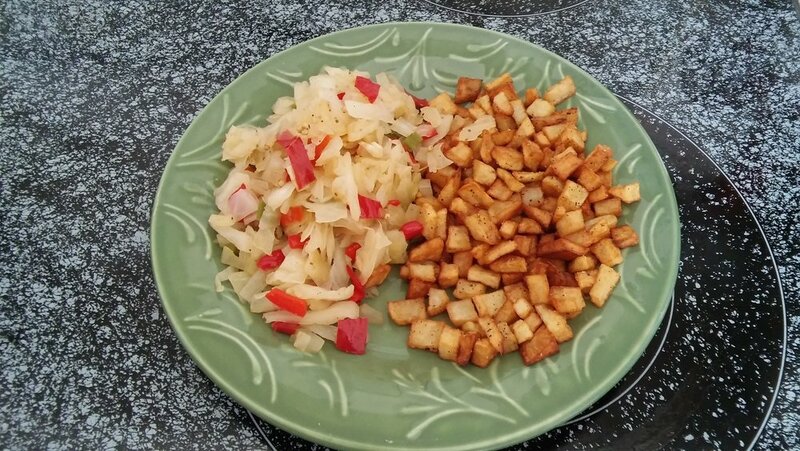 Sunday night was fried squash and Monday night was sauteed squash with onions and peppers. Tuesday night may be a casserole. This may be a book idea "101 Squash recipes." Do you have a good squash recipe? Email it to me and I can post it on the HPC website. Both of my grannies made homemade milk gravy. Granny Chadwell poured the gravy over toast and Granny Adkins poured the gravy over biscuits. According to medical professionals and nutritionists this recipe would be unhealthy. I am not too concerned because both of my grandmothers lived into their nineties. This is a simple recipe when you have very little in the cabinet. When you fry bacon save the grease. Put the grease in a can and store it in the refrigerator. The gravy recipe requires bacon grease, flour, and milk. Take a spoon full of grease and warm it in the frying pan. Heat on medium and slowly add flour. Brown the flour. Add milk to the desired consistency. I like a medium consistency. Not too thick but not too thin. If it is too thick add more milk. Too thin add more flour. Add in small amounts. Note that the gravy will thicken some as it cools. Add salt and pepper. Prepare toast or biscuits and add your gravy. 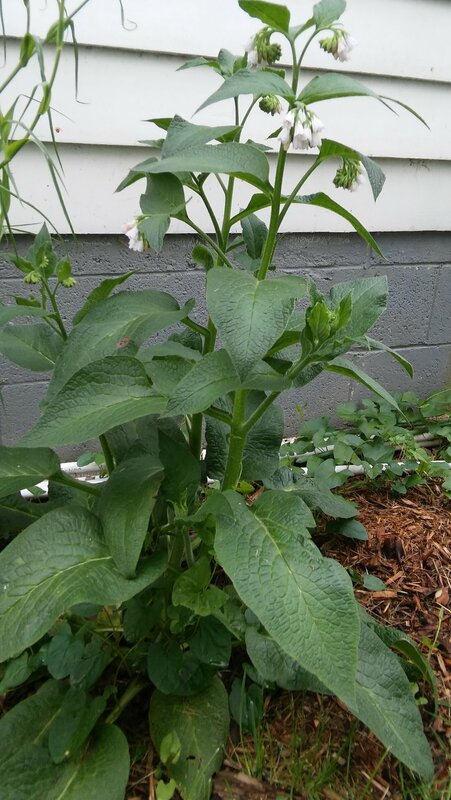 determining if the plants are weeds or something that I planted. when you purchase your plants. GRASSES. I HAVE A SMALL POND AND TWO BIRD BATHS IN THE BACKYARD. SOMETHING. DO YOU THINK THAT I SHOULD PLANT SOMETHING ELSE? I have installed a water collection system in the front yard by the porch and next summer I will install a system in the backyard. I plan to add an enclosed compost system, dwarf fruit trees, more edible pond plants and berry plants. My blackberries, blueberries and strawberries are ready to be picked. I enjoy going out in my garden early in the morning and picking a few berries for breakfast. The birds are enjoying my berries too. 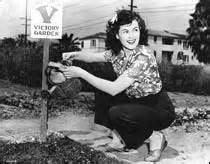 Have you planted berries? 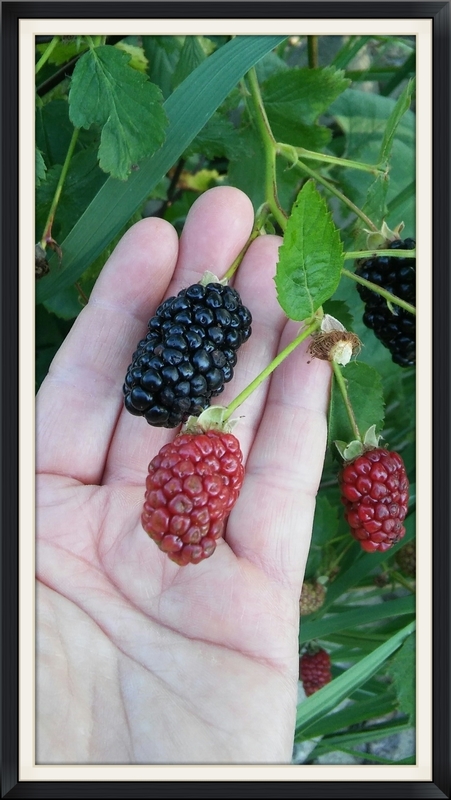 Do you have any fun berry picking experiences or recipes to share. Email HPC with your story or recipe and it may be included on the website. Consider planting berries if you do not have berries on your property. After planting it will take a year or two before you have berries but they are very easy to grow. Once you have them started, with proper care you will have years of berry picking. The birds love to visit my pond. My first tomato and pepper of the year. 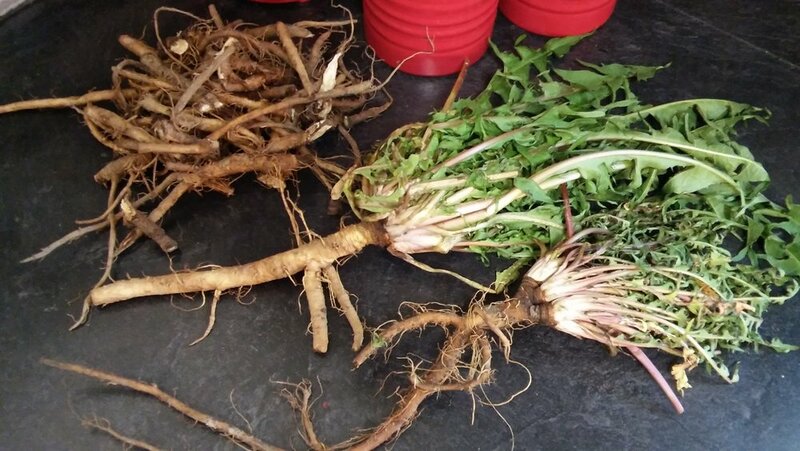 It was a nice surprise to see that my Swiss Chard and Milk Thistle came back this summer. There are many versions of this recipe online. The amount of ingredients will depend on the size canning jar you choose. 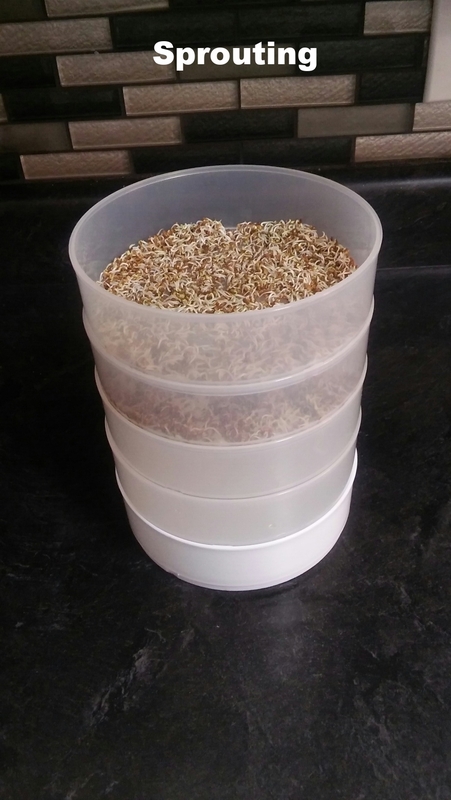 You will need enough chive blossoms to pack the jar and vinegar to cover the chive blossoms. Sterilize the jar before adding the ingredients. 1. Pick chive blossoms and rinse under cold water to remove dirt. Shake off excess water and put aside. 2. Warm white wine vinegar in a pot. Do not boil. 3. Pack chive blossoms in canning jar and pour warm white wine vinegar into the jar. Let vinegar cool. Place the lid on the jar and set the jar aside in a dark, cool spot for 2 to 3 weeks to infuse the ingredients. 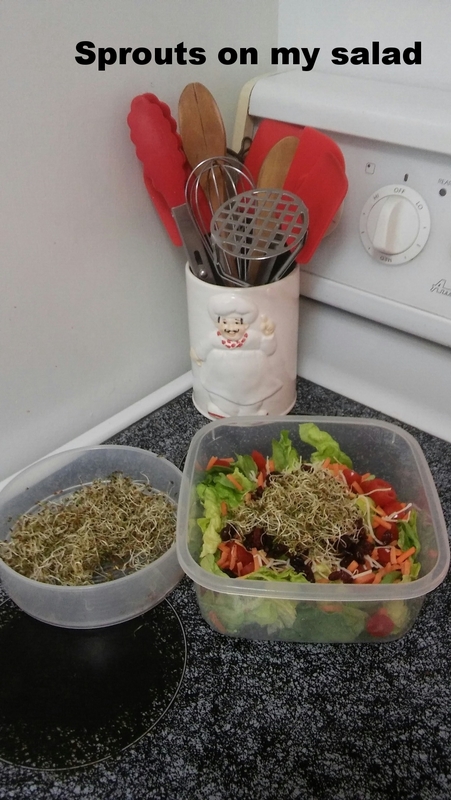 Use the Chive Blossom Vinegar over salads. It is April 29th and my Azaleas are blooming. It is April 28th and my berry plants have buds. It won't be long and I will have fresh strawberries, blueberries and blackberries. I stopped in Rural King the first week of April and I saw chicks for sale. If I had a coop I would have bought chicks. I love fresh eggs. Maybe next year. The weather was beautiful last weekend and I had cabin fever. I had to get out and work in my yard. I planted a few flowers and lettuce. Of course, my perennials are coming up - Phlox, Chives, Lilies, Hostas, Northern Sea Oats, Daffodils, Coneflowers, Violets, Black Eye Susans, and Sedum. The pictures below are projects in progress and finished. 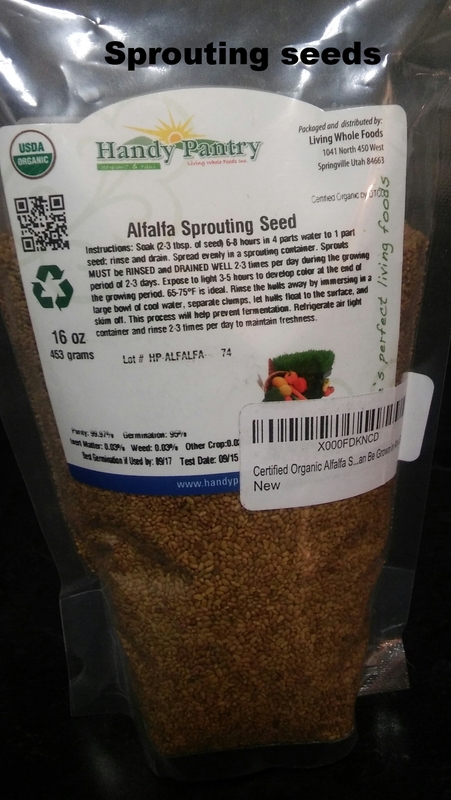 A solar heater, patio installation, a raised bed installation - stone and wood, inoculated mushroom logs, sprouting, homemade Christmas gifts, growing a new celery plant from a leftover celery stock, easy four item dinner, seed saving, drying herbs, preserving food, and cooking with garden produce. Each member of the collective team has accomplished their own level of sustainability depending on their area and situation. 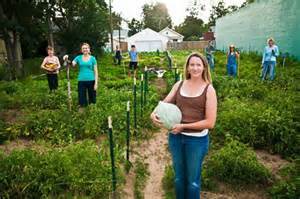 The levels of self reliance range from small urban gardeners to families who grow and preserve most of their food.